A “LED shining on photoresistor” attenuator. 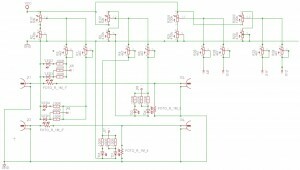 If you feel a certain adversity to “crackling” wipers in used up potentiometers, playing the role of volume attenuators, if you despise of nuisance artifacts whilst changing the volume, if you feer of the day when you shall yet again need to change the volume pot in your amplifier … In such case, you may wish to glance at this twisted idea of an optical attenuator. I’m not sure if this is the final “working” version of mine, which incorporates all the “tweaks” that I introduced, or not. But the basic concept is sound and “workable”. Actually, it is a set of “two independent LEDs shining on two independent photoresistors” – one such set per each channel. One playing the role of the “series” resistance (i.e. the “upper” part of your pot, the one going from “input” to “output”), and the other plays the role of the “shunt” resistance (i.e. the “lower” part of your pot, the one going to “ground”). Obviously, if you decide to embark on this project, thou shalt need a used-up black colored pen / marker. Actually, this is not about the “color” of the ink that I am talking about, but about the outer black tube-chassis that constituted the once-so- useful pen / marker, which is now only but scrap. c). a light-resistant, camera-obscura, impenetrable from the outside, one that protects the “insides”, as held within, from any and all stray light, or radiation. (at best: also excluding any HEAT, which to a certain extent is also … radiation). Now, having all of the above, all you now need is some black coloured electrical sticky insulation tape. Voila, your LED-o-Photo-Resistor is ready. I started off with the 1 Megohm photoresistors, but it turns out that it is much better to use the 10 Megohm ones. Funny as it may seem, but it is pure theory that they have such resistance. Under the even slightest of lighting conditions, their internal resistance starts to fall rapidly … to an extent where your photo-attenuator may exhibit a prohibitively low input resistance, as seen from your source. Better start fiddling with the 10 Megohms from the very outset. The picture below is a graphical depiction of the actual measurements that I have conducted on the LED-o-Photo-Resistors that I have made myself and that I am currently using. The horizontal axis is the logarithm of the current ( log ( uA ) ), starting from “low values”, up to a maximum that the LED was designed to cope with, i.e. 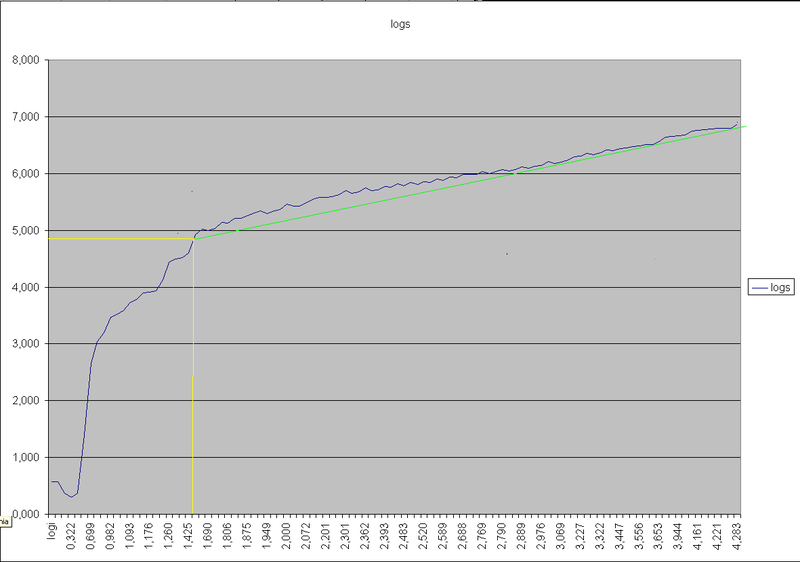 up to a logarithm of 20000 uA. 10R ==>> 100 000 nS. ==>> log(100 000)=5. 100R ==>> 10 000 000 nS. ==>> log(10 000 000)=7. 100k ==>> 10 000 nS. ==>> log(10 000)=4. 500M ==> 25 nS. 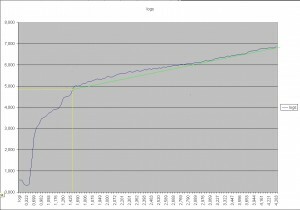 ==>> log(500)=2,69897…. So, having said that, the vertical axis represents the decimal logarithm of the value of nS. As can be seen from the drawing at the very right end of the graph, at 29500 microamperes of current flowing through the LED, we obtain a resistance of 134 ohms. Conversely, at the crossing of the yellow lines, we have a current of 29 microamperes and a corresponding resistance of 25,1k. Don’t go below that value, as the ride starts to get bumpy. Just for examples sake, at a LED current of 5 microamperes, the corresponding resistance is 40 megaohms. But the thing is, you do NOT want to go into those areas of the graph. Why ? Look at the graph. From the right side of the crossing of the yellow lines – all seems fairly smooth, in a logarithmic sense. But to the left of that yellow lines crossing point, all hell breaks loose. It may be of interest to you, so as to spare you a fair share of frustration: at all cost, try to AVOID the nonlinear range that is within the yellow rectangle. Within this area, there is a very small, tiny, miniscule, insignificant, close-to-nonexistent current powering the LED. This translates to almost-no-light. Which is equivalent to almost-total-darkness. The almost-no-light translates into “photoresistor-goes-crazy”. Crazy, meaning a highly unstable and nonlinear and non-repetitive performance. To make a long story short: Try to set up your attenuator in such a manner, that significant current powers / flows at the same time through BOTH of the leds: BOTH the serial LedoPhotoResistor, as well as the shunt LedoPhotoResistor. That way, you avoid the bumpy ride, as resembled at the very beginning of the graph. What you need to do is simply “shift” the balance of the current from the “serial” to the “shunt” – or vice versa. B.T.W – This crooked area of the beginning of the characteristic – this is also the very reason why you need to work with the 10 megohm values of photoresistors, or even more. This may initially may seem totally off-top, counter-intuitive and non obvious, but believe me – I have been there and I know what I am talking about. I am using it. Partially. The “volume” control, but not the “balance” between channels. 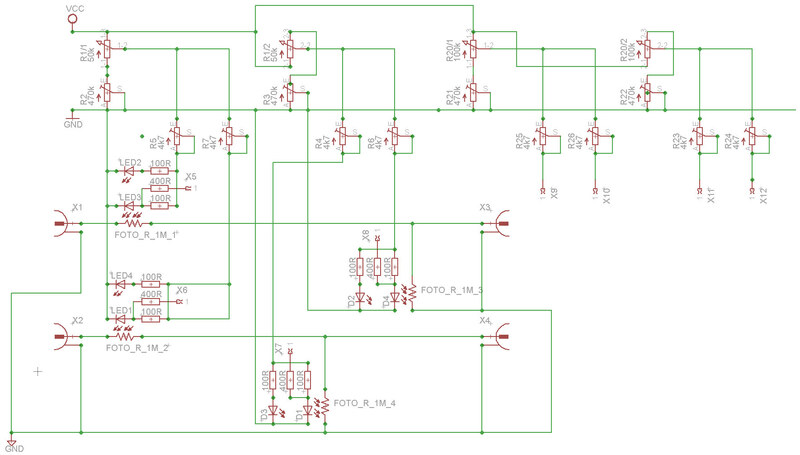 I actually did not yet come to the stage of using the “right” part of the schematic, which is intended to be a means of additional “BALANCE” control, but for the time being, it remains as a yet unresolved issue. The initial concept was so as to “feed” some additional voltages from those “balance” pots to the connectors of the “additional current supply” pins adjacent to each of the Leds. But as they are – things are already complicated. b). obtain a fairly balanced response between the left and right channel. This needs to be taken care of, as the individual photoresistors used are somewhat flaky in terms of tolerances and “replicability” of parameters. Once you have your LED’o-photo-resistoro-attenuator ready, please remember not to place it in any locations where there is excessive emission of heat. It seems that photoresistors are also inclined to absorb infrared radiation to a certain extent. Not critical, but nice to bear in mind.